Ahem. Anyway. THAT SAID, even I can find room to love a Star Trek game. Not like it. Love it. Which must make it pretty damn special! There have been a ton of Star Trek games released over the years. Many of them have been terrible. Some of them have been pretty good. One, though, was amazing, so much so that even a life-long hater of the franchise could enjoy it for what it was. 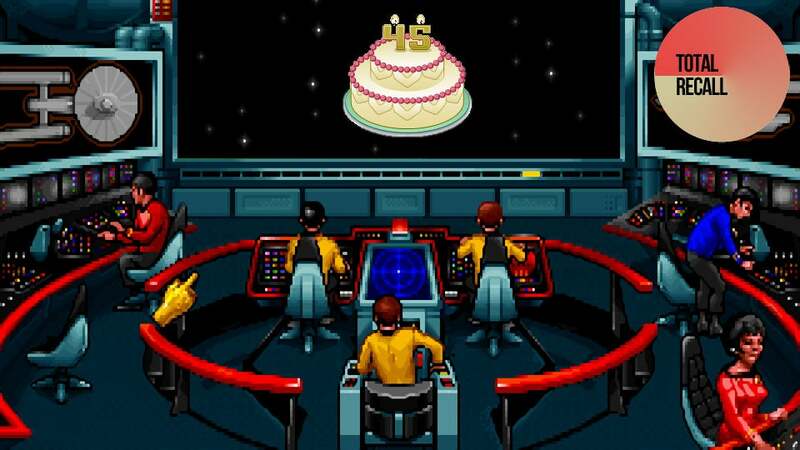 That game was, fittingly given this week's milestone, built around another birthday for the long-running series: it was simply called Star Trek: 25th Anniversary. Based on the original incarnation of the Enterprise and its crew (aka Kirk & Spock), it pitched itself as a fourth season, the 1966 TV series having only run for three. Released in 1992 for the various PC formats of the time (including the Mac!) and both developed and published by Interplay, ST25 was exemplary in almost every regard. Given the fact it was out in 1992, it took the decision to combine two of the most popular genres of the time: adventure and flight simulation. And somehow didn't screw things up. Missions on the ground or around the Enterprise, with your away team (which would include "red shirts" who, yes, would die) members, were played like a point-and-click adventure title. Sections in space, meanwhile (admittedly of a lesser quality than the top-shelf adventure portions), would put you in direct control of the Enterprise, sometimes even to the point of flying it around like a giant Spitfire and pew pewing at the bad guys. To combine the two was an accomplishment for the developers, but it's not why I remember the game. I instead remember it for the coup it managed in making it so faithful to the show. As a Star Wars fan with dreams of a similar project I could only look on in wonderment as Paramount and Interplay signed up nearly the entire original cast of the TV show to reprise their roles in the game, including William Shatner, Leonard Nimoy, DeForest Kelley, James Doohan and George Takei. Even Nichelle Nichols (Uhura) and Walter Koenig (Chekov) joined in. This lent the game, essentially a licensed tie-in, a level of professionalism we didn't start seeing regularly in other games until well into the 21st century. I may not like Star Trek, but you don't need to be a fan of something to admire its craftsmanship regardless. Especially when, aside from the big draws listed above, it made a few other smart decisions too, like breaking the game up into "episodes" (falling in with the "fourth season" motif) and including one of the greatest acts of copy protection ever devised. Like many games of the time, ST25 asked players to enter a particular code from the game's manual, in this case a set of coordinates. If you got it right, the game continued on as normal. If you got it wrong, though, you were warped into the middle of enemy space and thrown into an impossible battle, one you'd inevitably be killed in. As a first for Star Trek games, ST25 was both a critical and commercial hit, leading to the release in 1993 of a sequel, Star Trek: Judgment Rites. Again featuring the voice talents of the original cast, STJR was a fifth season to ST25's fourth, and made a few inspired changes like making the space combat optional. Like I said, for someone who hates Star Trek to enjoy this game must mean it was pretty good. If you like Star Trek and haven't played it, well...you probably should. FUN FACT: Judgement Rites was the very last time DeForest Kelly would ever play the role of Bones. 110% agree, this game is legit amazing and if you're a fan of TOS who hasn't played it, you are missing out. Sorry, only 99% agree here, because of the extremely controversial claim it was the 4th season. To many, that honor goes to the animated series... It went for two years, making the 25th anniversary game the 6th series. That aside, it was a fun game, wasnt it? So... not klingon honor guard? well thats it, i shall wait for gog to have a startrek/interplay/black friday sale and add the games to my pile of shame. i remember reading a small review for the game in PC Format ( a pc magazine that you purchased monthly fore thew youngins here) and dont recall it getting overly high scores. my dad was the big star trek fan and he didnt buy games which meant it was up to me...and i was too engrossed in my nes/snes games at that stage. this article has made me reconsider the games now that i have disposable lunch money.